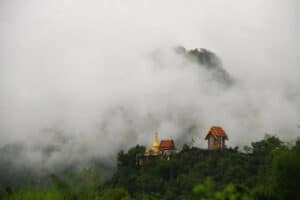 Sangkha Buri has been called as the land of three lines of fog, three different cultures interlinked with water, wonderful mountains and lush forests. The city has a wide variety of people of different races, nationalities and cultures of Mon, Karen, Laos, Myanmar and Thailand etc. The city is an important place in the history of The Pagodas war and The Death Railway. Sangkhla Buri is a district bordering Myanmar with large Mon population. The district is located in an area called the “Samprasop” The areas where three rivers meet, the Song Karia, Bikhlee, and Runthi flowing to converge to be the Kwai Noi River. 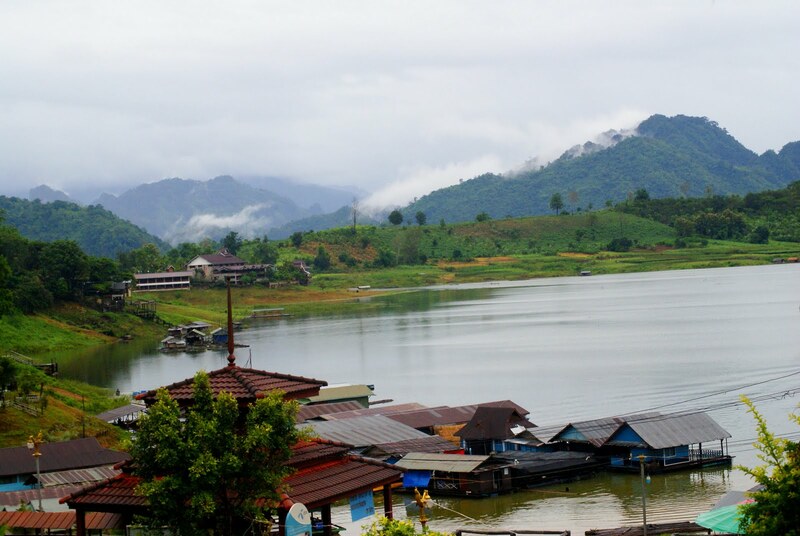 Sangkhla Buri is the place that suits people who like to enjoy spectacular nature, peaceful atmosphere and the laid-back lifestyles of people of mixed races and languages. From the port of Sangkhla Buri’s riverside is the Thai and Karen neighborhood and the opposite site is the Mon Village. There are small thatched houses scattering from the shoreline up to the hills behind. Beyond this are the Tanaosri Mountains, the Wangwiwekaram Temple and the Bodhgaya Pagodas are dominant visible from afar. 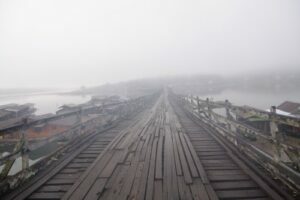 In the winter, the weather is cold covering with fog over the village and the river which is surrounded by beautiful green mountain views. If you go cruising along the river, you will see many houseboats parked near the waterfront and many square dip nets lined up to fish. To walk along the wooden Mon Bridge to travel in Mon Village should be done in the early morning. Walking along the bridge above the river you will see villagers’ boat passing by. You can see the big orange sun rising above the village among white haze surrounded by the big green mountains. There are small houses with simply construction lines along the water bank up to the hills. In the Mon Village, people live their traditional lives, men wear sarong and women wear tube-shaped sleeve shirt and sarong. Mon women normally power with yellow powder and plug some flowers on their bun. From Kanchanaburi province go through the high way number 323 (Kanchanaburi-Sangkhla Buri). Drive along the high way for about 220 kilometer then arrive Three Pagodas Pass junction. Then drive straight for around 6 kilometers to reach Sangkla Buri district. The way from Tong Pha Phum to Sangkhla Buri is quit steep and zigzaging so please be careful while driving and be prepared. Before traveling you should also check your car before traveling. At the foot of the Mon bridge in Sangkhlaburi. There are some boats to cruise along the river to watch the Underwater City. The boats called ‘E-Pap motor boat’. Seating for 4-5 people and chartering fee is 300 baht.